No matter where you go, you need to be an expert at communicating. The words that you say and how you say it are important, as they can be misinterpreted if said in a different tone. So having good communication skill is very important. Comminication skill is the ability to convey and share information to others in an efficacios way. It is a very vital skill and used widely in all work sectors. Communication can make or break your relationship at home or work or with your friends. If you have the skill then you can pass out your word across easily and precisely without any confusion. You can communicate with your body, words, gestures, expressions and much more. Communication is basically an act of interaction and sharing emotions and thoughts with others. It is the best way to receive, provide and exchange information, widely used in the business and professional sector. This is the most sought after trait every employer looks for in a candidate during the hiring process. In this type of communication, the use of words is done. It is a one to one type of interaction or sometimes more than 2. In this type of communication, gestures are used to share information like facial expressions, hand gestures, specifically saying body language. The best part about this type of communication is that it speaks in volumes. This type of communication uses signs, drawing, designs etc to convey and share information with others. The different forms of communication can be listed as – Listening, reading, speaking and body language. You need to have the patience and focus to listen and register what your peers are saying. You need to develop the reading habit to stay up-to-date and improve your vocabulary. You need to have good speaking skills that will help you to present your ideas in an effective and efficient way. You need to show good body language and hide your nervousness and show your confidence. You are confident when you communicate well and know that others have understood what you want. Good communication leads to high confidence and hence, you perform better at whatever you are doing. If you excel in your communication, you can express yourself better and climb the stairs of success. It is a known fact that every successful man or woman knows how to communicate in precise and clear manner. Crisp communication is what everyone is looking for, a way to attract and get your work done. We would surely get bored to death. Even a thought of such kind is scary, but luckily we all are surrounded by people around us which makes our lives keep going. As humans, we are bound to be social and is the key to make our survival possible and life active. Now communication is one such important life skill that helps us throughout. The best part is that it is not only limited to any sector but pitches its significance in all parts of life, like personal, professional, business etc. In fact, a research conducted by Harvard University, the Carnegie Foundation and Stanford Research Center, has stated that 85% of professional success comes if you possess good developed soft skills and people skills, and only 15% of career success comes from technical knowledge and skills (hard skills). So, the way you interact and behave with others plays a crucial role in your success. When you join a pre-school, it is the teacher who helps you in expressing yourself in front of the class and hence, your first step towards communicating with others. It is important that the teachers have good communication skills so that their students can follow in their footsteps and become good orators. This is a specialized field and a lot of importance is given when a teacher is hired. 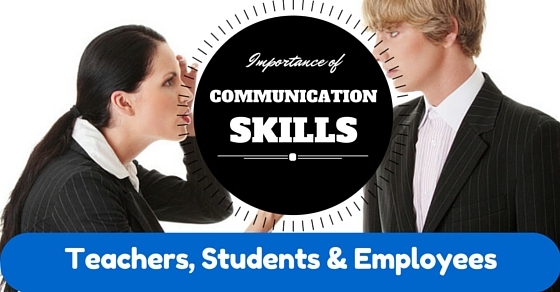 Communication skills are a new subject in schools and professional colleges. It is these teachers who help the student communicate effectively. A teacher needs to have good listening skills to know where his or her student stands and what is that he or she needs to focus on. While explaining a topic to a student a teacher needs to be clear and precise. You cannot jumble up the topic, confusing your students as well as yourself making it difficult for the student to grasp what you are saying. You need to adapt the style of the individual student so that you can ensure that every student’s weak area is addressed. A skilled communicator teacher can turn a boring subject into an interesting one by their good presentation skills. A good teacher will always show compassion and care towards their students with words or body language. They work with the students to ensure they excel in whatever they do and continuously encourage them to do better. They get to know the students personally by making sure that they address them by their names. They understand their fear and confusion and are there to counsel them if needed. They celebrate the success of their students in their own way to let them know that they are proud of them! An important part of a teacher’s job is to ensure that they have communicated the progress of their kin in writing as well as in meeting. A parent would always like to hear the truth, but how a teacher says it means a lot. A positive feedback to the parents give them the confidence, to do better but at the same time a negative feedback has to be shared. The way you share your negative feed is where a teacher’s communication skill gets tested. A complaint should be shared with the respective parent appropriately, on time and should be precise. Teaching a class is not an individual effort. You need to discuss and find out the best possible ways to teach a topic in an effective way. A school always encourages the teachers to sit together and devise an appropriate teaching technique by sharing ideas. As a teacher, you need to be aware of the changes in the educational system and attend or conduct seminars to ensure that everyone is on the same page. You need to listen, read, discuss and come up with excellent teaching techniques to ensure that your school does well. A student starts learning how to communicate right at home, but learning at school is a different ball game altogether. At school, the student learns how to address issues of peers and how to respond keeping the others in mind. It is important that a student works towards developing communication skills as it will help them in the long run. Student life is a foundation and hence, how we communicate in student life will define how we communicate professionally. You need to impart communication through reading, presentation skills, listening, writing and oral communication. One needs to be a good reader to develop your communication skills. With reading a student can enrich their vocabulary and knowledge. They can communicate in all the topics because of the knowledge base that has been developed with the reading. Being a reader is a stepping stone to become a good orator in the future. You can read books, newspapers, magazines, anything that you find interesting. It is important to be a good reader but it is equally important to be a good writer. By good write it does not mean that you can write books and articles on any topic. A good written communication skills is the one where the words express the right tone and put the idea across effectively. Written communication should not be confusing, it can send out wrong information and cause issues. A written communication can be used as evidence, and hence it is important that a student knows what to write and how to write effectively. Many students have issues in presenting their ideas or project. This could be due to stage fear, less confidence, nervousness and any other factor. It is important that as a student you participate in as many presentational and speech based activity to get the fear out and master the art. In the near future presentation and speeches will become an integral part of your professional career and you need to be comfortable with it. So, practice as much as you can, on your presentation and speech skills. You should have the patience and ability to listen to others and register their conversation. Conversation is not just about the ability to speak, it is about the communication ability to listen also. You can be a good orator only when you listen to your audience, understand what they want and prepare accordingly. You need to have the right focus when you are listening. With the focus and concentration, you can remember your conversation and take notes from it. As a student, you should not fear away or run away from conversation. Be it a school activity or just a group of friends; put your ideas across with no fear. The more you step back, the more issues you will have in future to express yourself. Participate in group discussion, interact more with students and be a part of a community where you can discuss every topic and improve your intellectual level. Keep communicating effectively in all the forms till you master the art! As you pass out from your college and it is time to get professional, the above communication skills will help in creating skills in your professional life. The professional world is all about good and effective communication in the form of writing, listening and speaking. If you have clear and crisp communication with your co-workers and your superior, then you can get your work done in a better way. It promotes consistency, effectiveness, commitment towards your work. You can attend workshops that can help you to brush up or develop professional communication skills. You cannot tell stories in your workplace because of the busy work schedule that one has. Your communication has to be brief, concise, to-the point. It has been of fewer words but more data. It all depends on how you can organize your thoughts and present it on paper or presentation. You have to be clear on what you want to convey in your conversation or communication and stick to that. Drafting a professional email or text message can make or break your communication channel. There are a lot of mistakes one can do, which can lead to confusion and miss-understanding. If you have an urgent request and are running out of time, then you need to follow up on your communication with a phone call. If you are unhappy with the email or text received, it is not good etiquette to call up the concerned person and have a personal meeting. Before you send out any communication you need to review it for grammatical mistakes, tone the data to ensure that your intention is clear. Be it a normal verbal conversation or within a meeting, body language can express a lot without you saying a word. Body language includes facial expressions, eye movements, hand gestures, posture; speak out on what you are feeling. Nervousness is likely to be identified on the basis of how you are reacting with your body. There are many sessions that are held to improve body language and show confidence. As you grow higher in your organization, your body language should be strong and communicate strength of a leader. Before you criticize your team members, you need to be careful on the words you choose. You should not get personal while talking and keep the communication strictly professional. While receiving feedback do not shut your mind. Accept your feedback and discuss on how and where you should improve communication skills. Always take negative feedback as a push to do better and not a personal rivalry. If you are sending out important work related emails then make sure you add weight to your content by conducting a face to face meeting. Visuals get registered better than words. You can get instant feedbacks and updates before receiving any further written communication. There is a need to appreciate the work that your subordinates do to ensure the success of your project. These face to face meetings ensure that you and your team are on the same page and share a good relationship. Merriam-Webster dictionary defines communication as the act or process of using words, sounds, signs, or behaviours to express or exchange information or to express your ideas, thoughts, feelings, etc., to others. Though communication is of different types, proper usage of it plays an important role. Also, communication skills are a little more polished version of the communication concept. To become a professional, you need to be well versed with good communication skills and also in other skills too. Now if you are the one struggling hard to communicate properly, then here are few effective communication strategies that you need to follow. Communication in all forms and in phases of life define who you are. It is a continuous process of learning and mastering a skill. You should learn from your previous mistakes, keep a note on what you have done wrong and how you can correct it. Do not take communication of any form lightly as it will hamper your future. It is important to learn the communication skill so that you can express effectively and efficiently. Next articleHow Bad Credit Can Cost You Your Dream Job?